Over the years my relationship with TV Lounge has evolved from that of a regular patron, to a dedicated supporter and contributor to both the obvious elements and nuances that make TV Lounge the unparalleled establishment that it is. I have grown close with TV's tight-knit base of employees through our mutual love for music, and creativity at large. But most specifically our deep love of Electronically based music, and Detroit's own Movement Electronic Music Festival. 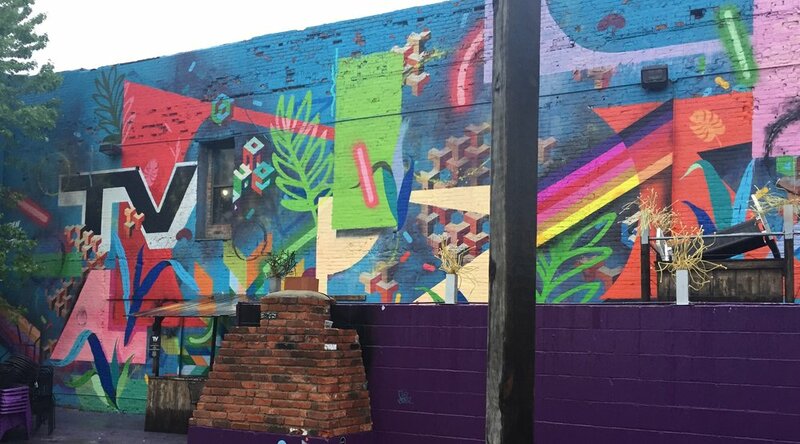 The Movement Wall Project began as an opportunity to gift a mural to my personal favorite establishment within the city of Detroit, in celebration of Movement 2015. Upon completion in 2015 I began to think critically as to how we could continue to activate and evolve the wall on yearly basis, while coinciding with the Movement Electronic Music Festival. Year, by year the Movement Wall has continued to playfully develop with each layer applied – Always being mindful in considering the content that was established in previous years. May 17th 2018 will mark year four of this unique and evolutionary mural project. Stay connected in the coming months for some very special developments I will be releasing surrounding the 5 Year Anniversary of the project in 2019. As always, thank you greatly to all my supporters and sponsors, past and present that continue to make this project possible. Major thanks to my TV Lounge Family and the incredible folks at Paxahau for allowing, and nurturing the Movement Wall Project's evolution!